In her splendid analysis of The Great Game [published on HotReview], the Tricycle Theatre's widely praised, eleven-hour cycle of plays about Afghanistan set between 1842 and 2010, Erika Munk observes that, informative as that earnest theatrical marathon was, it was also disturbingly complicit with our current military involvement there. 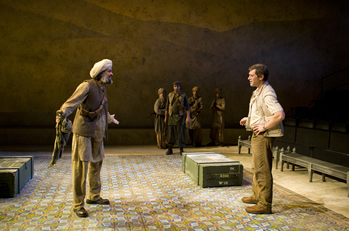 Yes, the plays asked critical questions about western intervention, and taught valuable history about the country to those who would never otherwise learn it, but almost all the dramas nevertheless portrayed the Afghans as too brutal, backward and corrupt ever to be left to themselves and thus implied that intervention is and always was justifiable and unavoidable. Because no play seriously considered the option of the great powers simply not playing the fateful "great game," the cycle ended up suggesting that occupying Afghanistan has always been the quintessential white man's burden, no less for the United States in 2002 than for the Soviet Union in 1979 and Britain in the 19th century. Occasional atrocities by exhausted and overburdened troops were treated as understandable occupational hazards. Small wonder high-ranking British and American military officials praised The Great Game when it was performed privately for them last year in London and Washington. How one feels about J.T. Rogers's Blood and Gifts--a full-length expansion of a one-act originally written for The Great Game, now receiving a superb production at Lincoln Center directed by Bartlett Sher--will very much depend on one's attitude toward the complicity Munk describes. If, like me, you believe that every penny and drop of blood America has expended occupying Afghanistan has been disastrously squandered--and that this should have been obvious from the moment Bush unilaterally declared 9/11 an act of war rather than a crime--then Rogers's play may enrage you. The rage will be an extension of the feelings that all of Bush's maladroit overreactions fomented for eight years. If, on the other hand, you are a forgiving "water under the bridge" type, if you think the putative good intentions of well-meaning cowboy-patriots are interesting despite the horror their ignorance and impulsiveness wreak, and that sensitive hindsight examination of their motives can be the stuff of powerful lessons, then this might be the play for you. Rogers is nothing if not fair-minded. He has interviewed experts to get his details right, as he told the Lincoln Center Theater Review: "What would you eat if you went to a party at the embassy? What are the kinds of things you would do? What would piss you off?" Blood and Gifts is indeed impressively realistic. It tells a touchingly compassionate tale about a well-meaning, square-jawed CIA agent named James Warnock (Jeremy Davidson) who is bent on outwitting the Pakistani ISI during the 1980s. Because the U.S., Britain and Saudi Arabia want to arm the Afghan mujahidin against the Soviets secretly, they give the ISI control over which commanders to support. The ISI chief--slimy and arrogant--chooses a bloodthirsty Islamist named Hekmatyar whom he thinks can be turned into a puppet after the Soviets leave, and Warnock works behind his back to arm a competing leader, Abdullah Khan, considered more humane and U.S.-friendly. 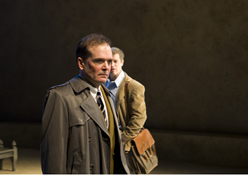 Advising and helping Warnock is a jaded, weather-beaten MI6 agent named Simon Craig (exquisitely played by Jefferson Mays), who is much more knowledgeable than anyone in the CIA and who lends the play something of a soul by warning (ineffectually) about various pitfalls. Brittle and ignored, Craig proves to be the hapless conscience of the play, as all the awful things he predicts come about, most horribly (because wholly avoidable) the power-grab by Islamic radicals after America callously abandons Khan and all of Afghanistan in the wake of the Soviets's withdrawal. Blood and Gifts features slimy politicians, duplicitous commanders, and ignorant goons on all sides. It is--I must concede--refreshingly untendentious, marvelously researched (the embassy food is utterly convincing), splendidly acted, and smartly directed, with offstage characters seated at all times around the edges of the stage as silent witnesses who occasionally confront others with meaningful glances and gestures during entrances and exits. Like The Great Game, Rogers's play is a fine teaching tool, serving up many books' worth of complex and important history as entertainment. In that sense, Blood and Gifts delivers as much as can be expected from its particular genre of realistic historical fiction. It teaches historical facts to people who would never seek them on their own and can thus proudly claim the mantle of Enlightenment social benevolence. … allow me to give you one piece of advice at parting: don't wave your arms about! Get out of that habit--of arm-waving. And another thing, building cottages and counting on the summer residents in time becoming independent farmers--that's just another form of arm-waving. A play like Blood and Gifts, or the one-acts of The Great Game, is, for all its good intentions, the equivalent of dramatic arm-waving in our time. Yes, it teaches (selectively) and thus lessens ignorance among the tiny group of citizens wealthy and privileged enough to see it, but the very modesty and conventionality of that ambition essentially dooms it to political ineffectuality, if not complicity with intervention. This is the ideal sort of drama for the History Channel age, when just about any atrocity, policy blunder, public lie, or colossally wasteful expenditure can evidently be packaged as inoffensive infotainment. One can almost guarantee before it opens that such a play will be so inoffensive it can do nothing to impede the massive and chronic misgovernment whose background it describes. Shaw once said to an ambitious young playwright who wrote asking for career advice that she should "do something to get yourself into trouble." The historical avant-garde was entirely built on that premise. Today, many say, artistic avant-gardism is moribund, its energies dissipated by the leveling effects of media-age cynicism and postmodernism. Whatever the truth of that, the Occupy movement shows that the core idea still has traction. If you provoke people, even (especially?) in the pseudo-serious era of Colbert and O'Reilly, they will pay attention, and sometimes even be roused to activism. If you don't, they will stay benumbed and asleep, even if you've gone to the trouble of teaching them a few things. Maybe it's idle to wish that Blood and Gifts were some sort of fire-breathing polemic about the Afghan quagmire, or a guerilla event that made news by, say, occupying public spaces and getting people arrested. That, however, is where the active and activist mind goes in a time like ours, contemplating savage political games in plush theatrical comfort.